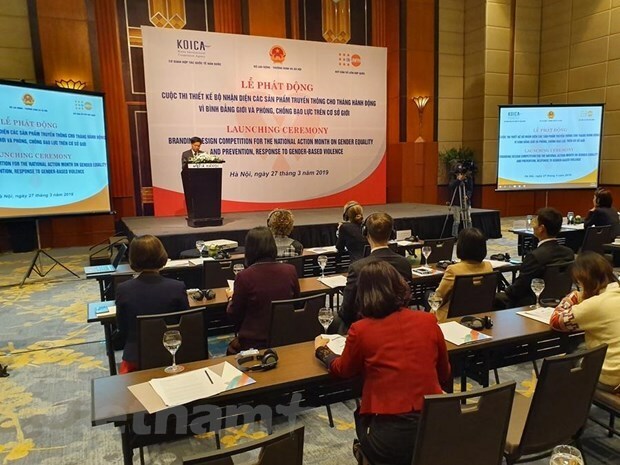 Hanoi (VNA) – The launching ceremony of a brand design competition for the national action month on gender equality and the prevention of gender-based violence was held in Hanoi on March 27. The contest is co-organised by the Ministry of Labour, Invalids and Social Affairs (MoLISA); the United Nations Population Fund (UNFPA); and the Korea International Cooperation Agency (KOICA). It forms part of the activities in response to the national action month of gender equality and the prevention of and response to gender-based violence, which will run from November 15 to December 15. The competition is designed to spread messages of gender equality and raise public awareness in a bid to encourage community action towards the building of a life of equality and without violence. It also aims to call for relevant agencies’ commitments to the implementation of activities in the national month. Speaking at the launch event, General Director of the Department of Gender Equality under the MoLISA Pham Ngoc Tien voiced his hope that the winning design will be able to convey the proactive message of the national month on gender equality. The design must include the national month’s logo and use the colour orange, which has been chosen by the United Nations as an optimistic symbol for a future without violence for girls and women worldwide, as well as the white ribbon representing the world’s largest movement of men and boys working to end violence against women and girls. All Vietnamese individuals above the age of 18 and collectives are eligible for the contest. Contestants can submit as many designs as they want in the required formats from March 27 to May 15. The winner will walk home with 50 million VND (2,150 USD), while two prizes each worth 5 million VND will be presented to designers with creative ideas and those from vulnerable groups.